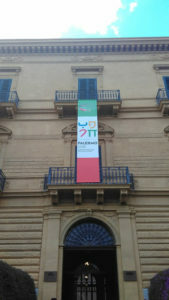 The city of Palermo has been entitled “Capital of Culture 2018”. Palermo is the capital of Sicily, it is indeed a big city blessed with the beautiful landscape of the Sicilian coastline, but also a lot of history and amazing cultural heritage. Such features are evident to anybody even just walking along the city center: the extremely variated architecture, the multiethnicity of the Ballarò, everything talks about Palermo’s millenary culture. To someone organizing a trip to Palermo, maybe the seaside and the street food might be the first thoughts (and who could blame them? It’s all so good!) but there is so much more to discover. I am Sicilian, I spent my teenage living in Trapani (here is my article about Trapani!). My hometown is so close to Palermo I have been there plenty (PLENTY) of times, for all kinds of reasons: holidays, school trips, university, meeting friends etc… And after all of these visits, I couldn’t see anything new in the city. But in reality, I was ignoring so much! The nomination as Capital of Culture 2018 gave the city a new input for tourism and cultural events. Among them, I have had the chance to join one during Easter Holidays (I am doing my MA in the Netherlands at the moment). Such event has been an exhibition organized by Federazione Sicilia, the main piece of the exhibition was as a portray of Donna Franca Florio, which will remain exhibited in Villa Zito until May 20th 2018. Let’s start with an introduction of the exhibition’s seat. Villa Zito was built in the XVIII Century, back then it used to be the palace of Francesco Scicli, it changed ownership several times (the palace owes its name to Francesco Zito, who named the palace after himself in 1909) before 1926 – when the Banco di Sicilia took it over. In those years, the general manager Ignazio Mormino had put together an exquisite collection of art pieces, was then entrusted to the Fondazione Mormino of Banco di Sicilia. In 1958 the Banco di Sicilia renovated the palace to use it for the exhibition of some archeological pieces from the Ministry of Public Education; in 1980 the exhibition has been opened to the public. In the year 2015 the palace has been turned into a seat for paintings’ exhibitions. The gallery covers 1000 square meters and includes more than 300 pieces, going from ‘600’s painters to 800’s Sicilian masters. I’ have been lucky to have the chance to join a private tour of the gallery, and I would recommend getting a tour guide if you are thinking of visiting the exhibition. The display is organized on three floors of the palace, the rooms divide the operas per historical period or artistic current. Personally, I found very interesting the pieces from Sicilian landscapers, and above all my favorite one was Renato Guttuso. 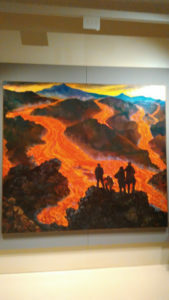 In particular, I found his painting L’Etna stunning. This beautiful painting is a portray of Jacotta della Motta dei Baroni di San Giuliano, an extremely charming woman, who the famous author Gabriele D’annunzio defined as L’Unica (The Only One), and the Kaiser William II used to call Stella dell’Italia (Star of Italy). She was a descendant of an aristocratic family in Sicily and became the wife of the Ignazio Florio. It was him, Ignazio Florio, who commissioned the painting to Giovanni Boldini in 1901, to immortalize his wife’s charm and beauty. 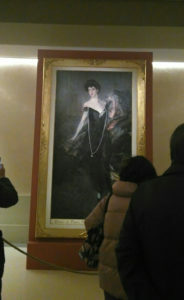 So, Boldini moved from Paris to Palermo, and has been Florio’s guest while designin the painting. The initial version of the portray is different from the one we see now: as Boldini was working on the painting, the fashion changed as well. While he was first projecting his painting, Boldini imagined Donna Franca Florio wearing a longsleeved black gown, with lace decorations. He also added and removed a chair several times. After a few years he changed the gown discovering Donna Franca Florio’s arms, adapting the style to the 20s’ fashion. There were rumors about an adulterous relationship between Boldini and Donna Franca as well. The painting was completed in 1903, however in those years Florio’s family was experiencing a dramatic economic breakdown, therefore they couldn’t afford the portray anymore. Consequentially, about twenty years later Boldini sold the painting to Baron Rothschild, who took him in the US with him. It took seventy years for the painting to be auctioned and brought back to Italy. It is finally back to Palermo, and exhibited to the public in Villa Zito. The location chosen for the painting is interesting: it is exhibited in a room in the half-light, which is meant to reproduce the light of a parlor of the early Twentieth Century, where we see Donna Franca moving graciously across the hall. In the same room you can see a reproduction of the dress represented in the painting, including the beautiful necklace and a description of the opera.